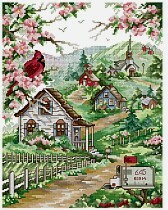 This pattern comes from the book Scenic Splendor number 246 from The Stoney CreeK Collection, Inc. The pattern displays a beautiful scene of a valley in the Spring Season. The pattern includes an alphabet and number line to be used for personalization. With Supplies: $61.00 You download the design. We will send you, 78 skeins of DMC Floss & Wichelt 14ct. 18" x 21" Aida (White) to complete your project.